No matter what I do, I cannot get a web site to load after something changes with the DNS. For instance, if meh.blah.example.com had a misconfigured DNS value and produced an ERR_NAME_NOT_RESOLVED then fixing the DNS issue would work on everyone else's computer in the office within minutes of making the change, but on mine it is stuck forever. Days can go by and I'm effectively locked out of meh.blah.example.com. This is making performing dev-ops a major headache. I've tried restarting my laptop. Tried turning off Chrome's prediction service. Trying on Safari doesn't fix the issue. If I run nslookup meh.blah.example.com 8.8.8.8 then Google confirms they can find it thru their DNS servers. Is it possible some service is running on my Mac I can't see that is caching things? 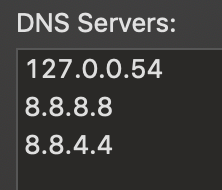 Browse other questions tagged google-chrome mojave dns .